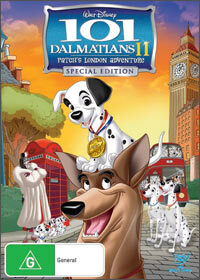 The classic 1961 Disney movie, 101 Dalmatian's now spawns a sequel in 101 Dalmatians II: Patch's London Adventure that is a direct to DVD movie and once again rejoins viewers to the wonderful world of talking dogs. It's quite strange that one of the main premises behind the original movie was a mad lady's attempt of creating a fur jacket from puppies that of course spawned a live action movie and became part of pop culture that series such as the Family Guy and the Simpsons have imitated. Although 101 Dalmatians II: Patch's London Adventure may not have that same majestic caliber of the original movie, it's definitely a worthy successor and begins with the Darling family moving out of their London flat to a farmhouse in order to cater for their army of puppies. Unfortunately for one puppy called Patch, he is lost in the move and as he explores London, he meets a variety of dogs to either assist or hinder him on his journey. One dog he meets is a German Sheppard named Thunderbolt (Barry Hostwick) who is an out of work action hero due to his sidekick, a Welsh Corgi called Lightning (Jason Alexander). Unfortunately for Patch, Cruella De Vil (Susan Blakeslee), the villainess from the original movie is still on the scene and now wants artist Lars to create a Dalmatian piece of art. With that said, Cruella De Vil sets her henchmen to collect as many dogs of possible in order to fulfill her strange fantasy. The animation of 101 Dalmatians II: Patch's London Adventure is visually quite impressive, although not on the same par as Disney films made for the movies. However with that in mind, the animation is still quite impressive and lends itself well to this format that is matched with Dolby Digital 5.1 surround sound. In conclusion, children will simply adore this Disney movie that features some great voice acting by all involved and a story that truly pays homage to the original 1960's movie. It's comedy, action and drama and is the perfect movie for the entire family!